MacBook generally comes with the highest quality and there are very rare chances when you encounter major damage due to improper design or any mishandling of the device. 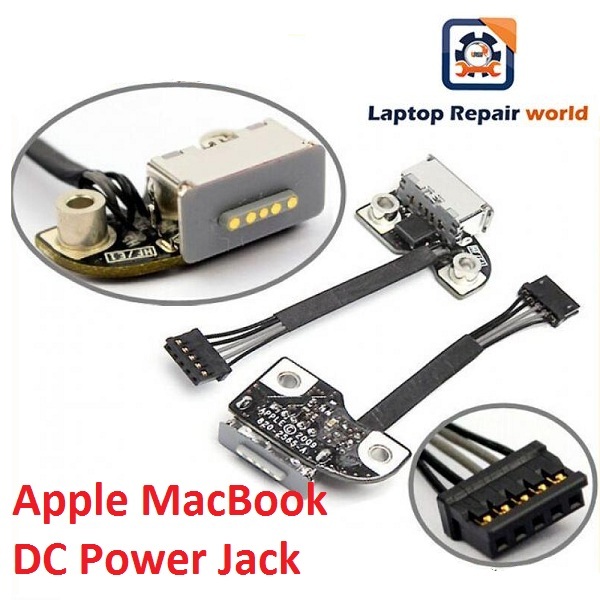 One such major damages usually happen to MacBook is the repair of DC power jack. But consider reading further to know more about our Laptop Repair World, where we handle numerous cases like this with all ease and care. Power Jack available for MacBook Air and Pro Models. Though many of you might assume the problem of Apple DC power jack as a minute, ignoring it for a long time will cause irreversible damage at times. So, we always recommend you to bring your damaged gadget to us so that we can examine it thoroughly and explain what needs to be corrected. To make your customer experience more productive, we always perform a minute examination on your damaged product which would bring out the unnoticed truths and details regarding the troubles you have undergone. This would help in problem-solving process as every decision taken would be wise and is performed only if needed. Many customers don’t prefer bringing their MacBook to service centres as they would be worried that handling them fort one repair would lead to some other. We understand your comforts and disturbances, so if you possess enough knowledge to dismantle your damaged component from the laptop then you can do the same and bring it to us. More than buying Apple products, maintaining it would bring greater difficulties. This is because they are quite costly and sometimes are unbearable and force you to get struck with the broken device. So, we have decided to repair your gadgets at an affordable price. We believe in loyalty and consider it as our strength factor as many customers revisit us again and again just to reduce the stress in rushing and finding other stores, when they can get all qualitative services here. Let us know your views and doubts regarding the mentioned topic by commenting down below. You can also get to know by visiting other articles in our site or by contacting us in personal.